Blade speed is key here. 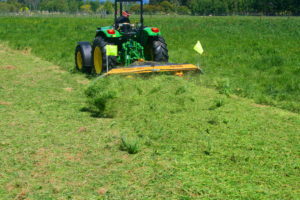 The Maxam mower has the same blade speed as most disc mowers, which is about 80 m/sec (300 km/h). This speed is needed for a clean cut, and to generate enough centrifugal force on the blade to hold it rigid for efficient cutting. The other secret to the efficiency of the MAXAM + Wilter combination is the tip speed of the Wilter Tyne. This is about 17 m/sec (60 km/h) which is the same as specialist tedders. 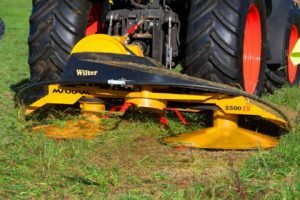 The Wilter tyne picks the cut grass up off the Maxam cutting drum and tosses it in an arc. The heaviest and wettest part of the sward gets thrown the furthest, landing on top for the most exposure to the sun and breeze. Our method gives the fastest and most even drying. The combination of high blade speed and slow Wilter tyne speed is essential to the MAXAM + Wilter combination. This is in contrast to normal toppers which have a blade speed typically around 50 – 55 m/sec (180 – 200 km/h). This is halfway between the Maxam mower blade speed and Wilter tyne speed. This is a compromise which gives a reasonable cut in easy conditions and normally some kind of spread, however nothing like a MAXAM mower. 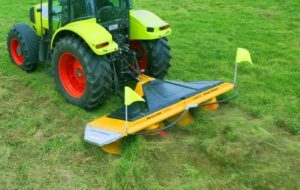 Disc mowers may seem fine for topping and in many cases they are – with a couple of downsides; they need a constant flow of grass over the bar to stop them overheating, and being out the side of the tractor, they are more susceptible to accident damage. They are typically a lot more difficult to set up correctly as opposed to the fit-and-forget style of the Maxam mower. Maxam mowers have been described as boy proof, which somewhat explains their unrivalled simplicity – so safe and easy to use!